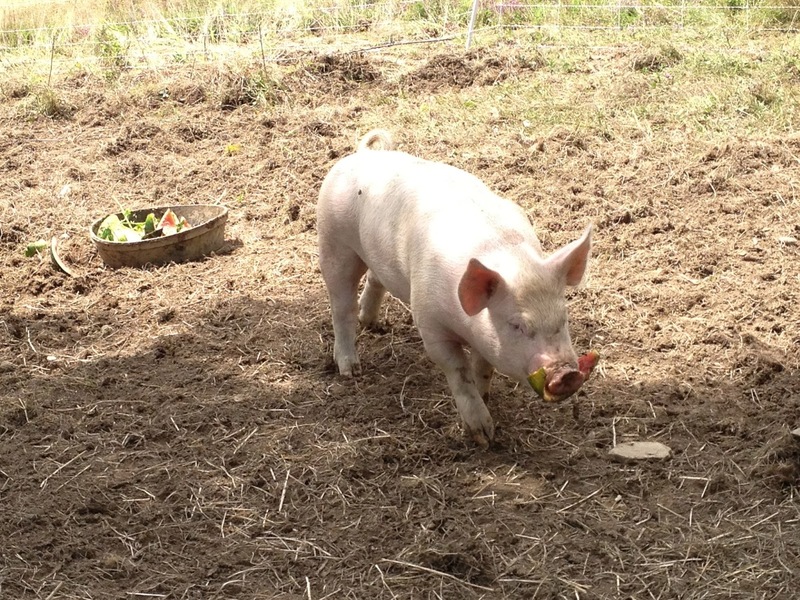 There's a new critter on the farm! His name is Clyde and he's a homicidal maniac. Here he is, hunting in the high grass, one of his favorite pastimes. Clyde, like Farmer Fin, is originally from Brooklyn. In fact, we used to be roommates. Born eleven years ago on the mean streets down by the Navy Yard, a very cute teenage Clyde followed roommate Rachel home one day and begged to come in. He never left, and when we moved into a different apartment, he came with us. Clyde belonged to all of us, but he ended up with Clara, the last to leave that apartment. They lived together for four years or so; the studio they shared is spacious by New York standards, but apparently not enough for Clyde, who amped up his destructive habits in some kind of feline campaign to drive his generous caretaker out of her mind. Desperate, Clara appealed to us, the countriest of her country friends, and a month ago I picked up her and Clyde at the Albany Amtrak station and we installed Clyde in his new home, the barn. Clyde, like Farmer Fin, is a natural! He has adjusted very well to farm life. Within a few days he had figured out the ladder to the hayloft, and we have been finding a variety of rodent parts around the barn. He seems to enjoy the feeling of grass under his paws and the warm sun on his fur. I think he's enjoying his new station in life. Last weekend marked the five-year anniversary of our move here from Brooklyn. We came with a five-year plan and a vague knowledge of the learning curve ahead of us. We jumped right in to the Farmie Life (to quote the title of a PowerPoint slide show we put together in order to convince our families we were not insane to leave the city for these pastoral environs), and although I sometimes wish we had acted with more forethought, five years later we are actually, surprisingly, pretty much on track with the original plan. But the relief soon festered into a full-on case of writer's block. And the writer's block, as it always does, got all snarled up in a litany of personal insecurities: I have nothing to say because I'm boring, lazy, incompetent, a dilettante, etc. The thing about living here though, is that it's hard to stay entirely focused on oneself, because there's so much demanding attention. Which is what happened to me this morning, and I just felt so fortunate. Maybe I'm a disorganized loser and all that other stuff, but I guess I've made a few good choices. Life is completely out of my control, but those choices resonate throughout it. The Farmie Life is exhausting and scary and confusing and so beautiful that it nearly knocks me down sometimes, and I love it. I loved it this rosy morning and again in the silvery evening, looking at the leaves changing colors just like they did the first week we lived here. Used to be, when we moved the goat pasture, Farmer Fin drove the truck that pulls the sheds while I ran behind shouting encouragements, tried to manage the livestock, and hooked and unhooked the sheds to and from the truck. We recently discovered, though, that it all goes more smoothly if I just take the goats down the hill and distract them while Fin does all the other stuff. Naturally, this arrangement works for me! And what better way to distract a herd of goats than hanging out under the apple trees. The apples are getting ripe. It's a good time to be a goatherd. 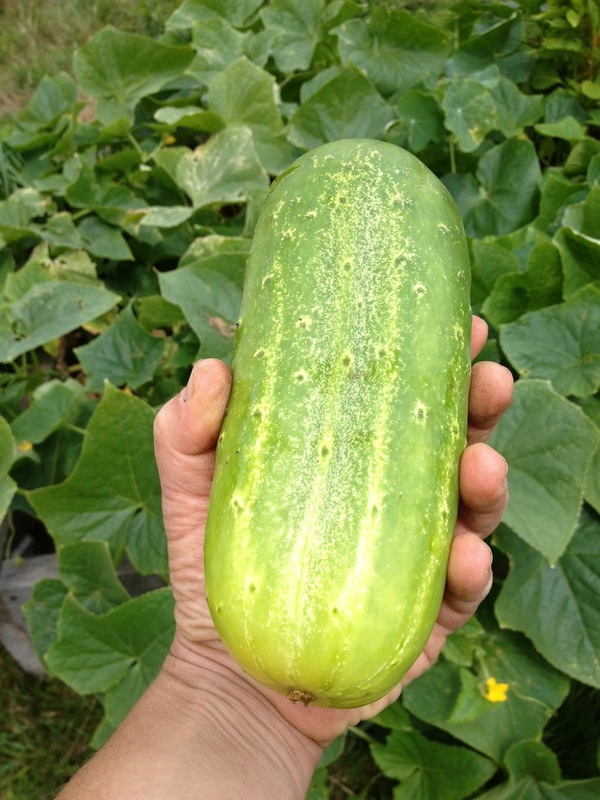 In June, I planted cucumbers, as I always do. Shortly after the plants came up, they were eaten by rabbits. I cursed the bunnies and replanted, certain that there would be no cukes in my garden this year. Boy, was I wrong. I ended up with nine pickling cucumber plants and four slicers. Now I am harvesting every day, and even still, there's always a cuke that hides beneath the leaves and grows to be a big fat monster. Granted, my hands are small, but still! Today I pickled at least eight pounds of cucumbers. I like them garlicky and dilly, fermented or fresh. Here's my pickle inventory so far, minus the jar of sour dills in the fridge. In the foreground, today's fresh garlic dills. In the background, a crock of sour dills ferments, to be canned in a week or two. And on the right, two quarts of spears ready to start fermenting. After this, I think I'll have to get creative. Luckily, this year, the monster cukes won't go to waste. The pigs love them almost as much as they love watermelon. The goats have made it to the top - the highest pasture on the hill, "where the air is fresh and clean," as the Tom Waits song goes, and where the big rusty old farm implement is, for Bluebell's enjoyment. The building is coming along. Behold our prodigious temporary work station, complete with genuine electricity. It's awfully nice to be off the floor, and the power tools are much more powerful now that they are not plugged into 250 feet of extension cord. Besides that, here's how it's coming along. This picture is from last week - now you can't see through that wall. The wiring is all finished. We are working on interior walls. The milking parlor is an actual room now. That is probably where the milking stand will be. There are two walls in the milk room so far. And the hayloft is the perfect place to cure garlic. Rest assured, we will not fall victim to vampires before we finish building this barn. There are over 200 heads of garlic hanging there! Cotton Hill Creamery just got a little closer to legitimacy, i.e. New York State Licensing. This little beauty right here is our new pasteurizer and cheese making vat! Our cheese room setup cost as much as my car, but unlike my car, it was delivered by the people who designed and manufactured it. Frank Kipe and his wife Mary, of MicroDairy designs, installed the equipment and then spent the entire day here teaching us how to use it and sharing their wonderful wealth of information, ideas, and stories. Pasteurization is the process of heating a liquid to a specific temperature for a specific amount of time in order to kill pathogens (in case you were out of school that day, https://en.wikipedia.org/wiki/Pasteurization), and it is very important to the Department of Agriculture and Markets. Personally, I have more of a from-the-teat-to-the-mouth attitude, but I can see the benefits of pasteurization from a public health standpoint. 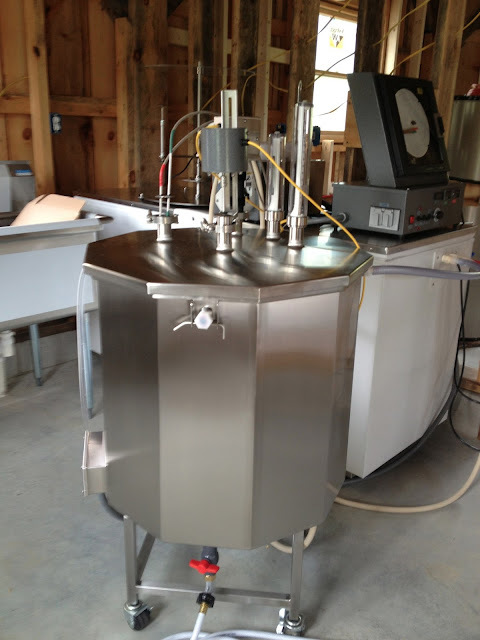 So we'll be pasteurizing milk for any product the creamery will sell. We practiced with a batch of water. Thermometers! Agitators! Little motors! Bells & Whistles! All the components are gorgeous. Using this equipment makes me feel like a scientist, and feeling like a scientist is one of my favorite feelings! One fun thing to do on a Saturday afternoon is feed the goats some garden gleanings. Today we had a bucketful of Chinese cabbage that had gone past its prime. It was madness! They seemed to be having a good time, and I think everyone got a leaf or two, one way or another. Every summer here on the hill, several times a day, I have to stop what I'm doing and just take notice. The color green saturating the landscape, the feeling of cold mountain water on hot skin, the breeze that precedes a rainstorm, the way it stays light out until nine, and of course, the food. So much variety, and everything tastes so good! Last weekend we visited Sherman Hill Farmstead in Franklin, NY and Dirty Girl Farm in Andes as part of the Catskill Family Creameries Open House, which you can read about at http://www.catskillsfamilycreameries.com/index.html The farmers and cheese makers were really nice, answering all of our million questions; we barely made it home for evening milking! Sherman Hill's aged cheese made an excellent snack while we cleaned and cooked the chanterelles we found on Monday. Speaking of snacks, I can't walk by the sugar snap peas without eating at least one. I never get tired of them! After the birds ate all my sour cherries, I wised up and covered the raspberries with bird netting. So far, so good - I harvested the first full pint on Wednesday. Breakfast has been extra special ever since. 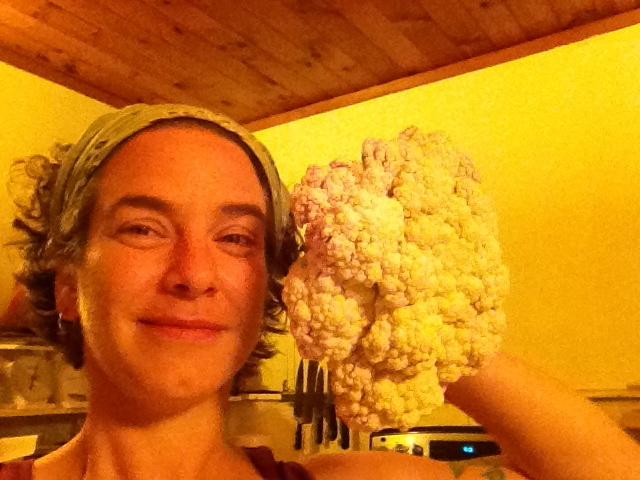 Or do like Farmer Fin's sister, Little Debbie, and steam the cauliflower until tender, chop into tiny pieces, and toss with tahini, lemon juice, salt and pepper. A few summers ago, I had sour cherries for the first time. I bought a quart at a farm stand and made one precious jar of jam. This spring, Farmer Fin bought me two little cherry trees for my birthday (and planted them for me too). Unexpectedly, the sour cherry tree bore fruit a couple months later. I anxiously watched it ripen, until one day, it was almost there...and the next, there were only pits left on the stems. Curses! What could I do, but head downstate to pick sour cherries. With the help of some friends (thanks Levy family! ), I came home with seven pounds of them. With 19 goats in the yard this summer, pastures get ravaged pretty quickly. Fortunately, we can hook the portable electric netting to the perimeter fence, and we rehabilitated the old length of netting, so now we have three 150-foot lengths plus 100-200 feet on the perimeter fence. This allows us to extend and move the goat yard as needed, without necessarily moving the sheds, which saves a lot of time. Their current pasture is lovely with all the hot, humid weather we've been having, because part of it is in the forest. In the photo above, you can see the grass they've been eating for two weeks in the foreground, and the tall stuff that they just got access to in the background. The trees on the right are within the yard, so the herd can graze in the shade. I joined Violet and some kids in the shade. They ate grass. I watched. The others saw us, and they wanted in. Who's that hiding behind Vervain? I believe it's little Peony. Peony is growing fast! Must be all that grass. As the summer progresses, their pasture is moving farther up the hill. Soon they'll be at the top, where there are plenty of trees to shade them from the summer sun, and plenty of space between us and those kids, who are getting pretty loud and find all sorts of reasons to holler their little heads off. In a month or so, we will start the descent. By the time fall turns to winter, they will be close to the house again.